Are You Up to Date? NEW Root Cause Analysis Books! We are making a major move forward in 2017. There will be a whole NEW basis for TapRooT® when we are done writing the nine new books that will document the TapRooT® System. Some of the new TapRooT® Books are out and are available on the TapRooT® Web Site. What is out so far? 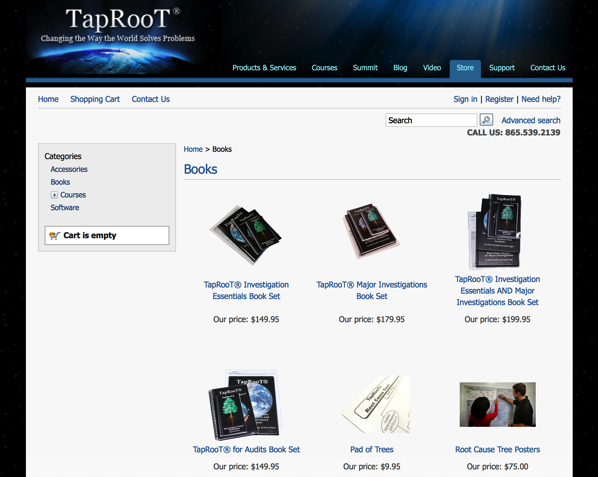 If you would like to get the TapRooT® Essentials Book and The Major Investigation Book at the same time, you can get them for a discount by CLICKING HERE. These new book sets will include the latest Root Cause Tree® (2015), Root Cause Tree® Dictionary (2016) and Corrective Action Helper® Guide (2016). We are excited about the advances we have made and how usable the new books are. We have made major strides in making TapRooT® easy to use. We even have a new five step process for doing a low-to-medium risk incident investigation. There is excellent new materials that completely document the entire 7-step TapRooT® System and all the TapRooT® Tools. This book details the way you can apply the TapRooT® Tools to your proactive improvement efforts – especially audits. Each of these books are tied to new courses. The TapRooT® Essentials Book is tied to our 2-Day TapRooT® Root Cause Analysis Training. The TapRooT® Major Investigations Book is tied to the 5-Day TapRooT® Advanced Root Cause Analysis Team Leader Training. The course reviews a copy of the TapRooT® Essentials Book. And finally, the Using TapRooT® for Audits Book is linked to our 2-Day TapRooT® four Audits Course. We hope you will find these books (and courses) as helpful as others have.